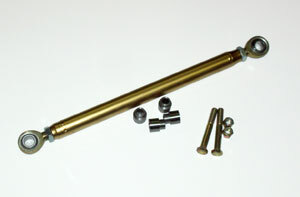 a) Convert your 1993 - 2002 Camaro or Firebird to manual rack and pinion using these NHRA legal components. 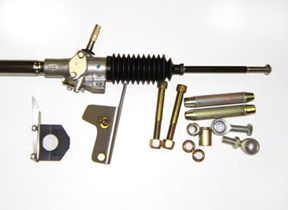 Kit includes the popular Wilwood rack and pinion, mounting brackets to weld to your K-member, adjusting sleeves and correct tie-rod ends to adapt to your spindles. b) Kit is also available with spherical rod ends and bump steer eliminator spacers for racing categories that allow it, other than NHRA stock eliminator. 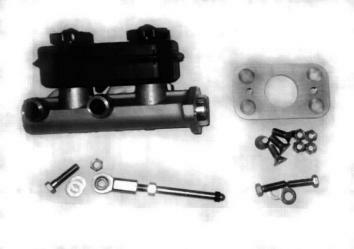 Race only, redesigned bolt-in motor mounts for 1993-2002 "F" bodies. These lightweight chrome moly mounts are heliarc welded for strength and ease in changing and finding engine location using stock side mount bolt holes. Available for LT1 and LS1. Please specify V6 or V8 K-Member, as well as engine cradle used (ex: V6, V8, LS1). Also available in unwelded kit form. Used by NHRA's best - Dan Fletcher, Scotty Richardson, Terry Allison and more. The Ultimate Traction Bar is available in bolt-on configuration for NHRA Stock Eliminator and other classes requiring bolt-on only traction components. Special brackets bolt to the rear end housing and also the lower control arm with a tubular link and rod ends making the arm into a mini ladder bar. Left and right hand threads make adjusting the bars for both pre-load and weight bias easy. Includes all brackets, zinc dichromate plated, chrome moly tubes, teflon lined rod ends and all hardware to bolt on. These are the "Cadillac" of bolt-on traction bars. 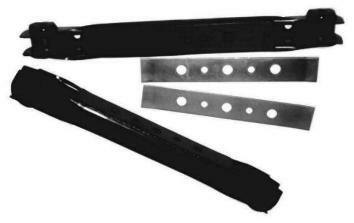 Constructed of 1 1/4" chrome moly tubing, for maximum strength for breakage prone stock torque arms, the S.P.S. torque arm has an adjustor in the lower link with left and right hand threads for ease of adjustment of pinion angle. Mounting brackets are made of 1/4" steel and directly bolt to a stock-type rear end housing. Rod ends are teflon lined and all hardware zinc dichromate plated. Front pick-up point is constructed with a slip fit to eliminate bind found in most other aftermarket torque arms. Requires fabricated and welded front mount (at extra charge). Where rules permit any lower control arms, these ultimate lower control arms are fabricated from 1 1/4" chrome moly tubing - the same tubing as our heavy duty 4-link bars - with left and right hand teflon lined rod ends for ease of adjustment. 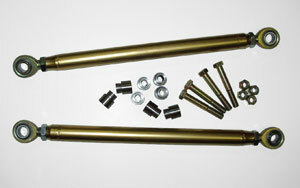 Kit comes complete with links, rod ends, all hardware and spacers. All parts are zinc dichromate plated for appearance and corrosion resistance. Available for 1982 - 1992 and 1993 - 2002 "F" bodied GM cars. Made of 1 1/4" chrome moly tubing with left and right hand teflon rod ends for ease of adjustability usually required when lowering ride height. Kit comes complete with link, rod ends, spacers and hardware and is zinc dichromate plated for appearance and corrosion resistance. Fits 1982 - 1992 and 1993 - 2002 "F" bodied GM cars. Don't want to spend the money on expensve aftermarket lower control arms that little or no advantage over stock ones. Why not box your stock control arms. Boxing plates can be welded by MIG or TIG welding to stiffen and strengthen the stock control arms. These lower control arm bushings, engineered by Smith Performance Specialties for Stock Eliminator cars, are designed to free up lower A-arm travel by eliminating troublesome production bushings in stock lower control arm. 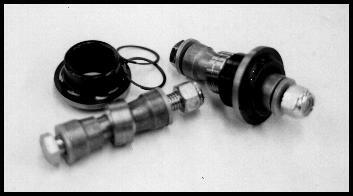 Kits include spherical rod end, misalignment bushings, housing, and all hardware. Master cylinder modifications are a must when converting your car to a race car. Our brake kit uses popular Mopar style master cylinder, firewall mounting plate, rod and heim and all hardware. Also included is instructions for modifying your pedal assembly for correct ratio to ensure optimum brake pressure. This unit saves several pounds from the stock master cylinder and has the correct capacity for today's disc brake systems. An excellent addition for the foot brake racer by virtually eliminating problems holding the car on the starting line. Specify your make of car and pedal assembly used. Many cars, especially those foot brake racing, require high brake pressure to hold the car in the starting line. Unfortunately, these high forces combined with firewall modifications cause a great deal of flex in the firewall deflecting the master cylinder causing a loss in brake pressure. This optional master cylinder brace helps eliminate this flex. The kit comes complete with brace, brackets and hardware. Specify year and model car.